The vast amount of manmade debris in orbit around Earth is untenable, but emerging and currently available technologies could be used to get these objects under control. 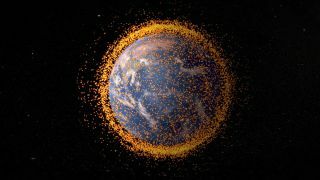 Humanity is generating space junk more quickly than the debris can fall back toward Earth naturally, putting satellites and spacecraft at risk of colliding with speeding pieces of debris. Unless something is done, the problem could get worse, said Donald Kessler, retired head of NASA's Orbital Debris Program Office. Artist's conception of a future mission to deorbit a piece of space junk. At the moment, NASA officials estimate that about 500,000 pieces of debris larger than a marble orbit the planet. There are 22,000 bits of junk as big as a softball, and there could be more than 100 million tiny fragments at least 1 millimeter across racing around Earth. But how can mission controllers on the ground remove those troublesome pieces of space junk — including defunct satellites, spent rocket stages and other pieces of manmade debris — from their dangerous orbits? Technology readily available today could mitigate the space junk threat, Kessler said. By taking only five satellites out of orbit each year for the next 100 years, while adhering to an international understanding called the 25-year rule, space agencies could stabilize the orbital environment, according to a NASA study. The 25-year rule stipulates that nations should not launch objects whose lifetime in space will exceed 25 years after the completion of their missions. Space agencies could also rely on a somewhat basic method to remove the debris, Kessler said. Engineers would need to develop some kind of technology to grapple the target piece of debris and pull it into a part of space where it could quickly to burn up in Earth's atmosphere. "Technologically speaking, the easiest way to do it is what I've been referring to as the old-fashioned way," Kessler said. "You just design a spacecraft to go up and get it, attach a rocket to it and send it on its way or wherever you want to put it." There are other, more high-tech options on the horizon for space cleanup as well. The Defense Advanced Research Projects Agency's (DARPA) Phoenix spacecraft project would use old, but functioning pieces of defunct satellites to create new space-based systems — instead of adding completely new satellites. Officials working with the program would launch a "tender" vehicle that would make use of small "satlets" launched without an expensive antenna needed to make satellites function. Once in space, the tender would move a relatively inexpensive satlet to a defunct geosynchronous satellite. There, the old satellite's antenna could be recycled and incorporated into the tiny satellite, effectively creating a new communications system without necessarily producing more space junk. Scientists could also use lasers to mitigate the risks posed by orbital debris. "There are two ways that a laser works" to get rid of a piece of space debris, Kessler said. "One is using what they call photon power — just letting light waves slow it down until it re-enters [Earth's atmosphere], but that works really well on small stuff. Space junk-targeting lasers probably won't be built anytime soon, however, because the national security implications of such a tool could make it a non-starter, Kessler said. That is, the possibility of weaponizing a powerful space or ground-based laser could make building such a device politically difficult. Another mission — expected to launch to space in 2015 or 2016 — will aim to rendezvous with and grapple obsolete satellites. CleanSpace One, a project of the Swiss Space Center, is designed to be the first satellite capable of grappling a piece of space junk in orbit and plunging with it into Earth's atmosphere, disintegrating both spacecraft. In trailers for the film "Gravity," opening Oct. 4, a huge cloud of debris can be seen hurtling through space, destroying or damaging a space shuttle, the International Space Station and the Hubble Space Telescope. While the movie depicts an extreme example of a space junk catastrophe, the scenario is not impossible, Kessler said. "I suppose all of that is possible, [but] it's not very probable," Kessler said. "The object that broke up could have been in a slightly elliptical orbit because Hubble is higher than the space station, and if it were to break up in an elliptical orbit, it could go through the Hubble altitude and the debris could orbit down to the space station altitude." And if the space station "happened to be in the right spot, it would go through the same cloud," Kessler said.